When I bought my truck I had no idea I was going to own a boat. The main reason I bought the truck was simply to accomodate my lifestyle. For example; Having a truck is perfect for carting loads of wet diving gear about the countryside or having the ability to simply jetwash the mess made by muddy mountain bikes from the back, while the cab remains clean and dry is such a pleasure. Since buying Lady Jane the truck has been invaluable. There is no way any of my previous vehicles, including a Subaru Impreza and a Jaguar XJ12, would be as suited to the task of fetching and carrying the sorts of loads which have been so common lately. 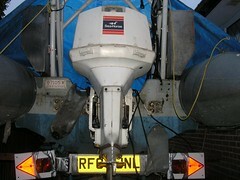 The biggest kick I get out of the truck is when we are towing the rib with our shiny new towbar. It is a very cool feeling cruising through the streets with a rib in tow right there behind us. I'm sure nobody really cares, but it's nice to think of people staring at this big tough rib being hauled behind a big tough truck, wondering where we are going or what we are going to do. Now I just need to get the hang of parking the truck and trailer, especially that reversing at night thing. Ray, a good friend of mine, e-mailed me an amazing story of someone's first time at the helm. What an experience that must have been, trying to teach someone to steer a 40 foot boat when they keep on panicking, then running away! There is no doubt that being at the helm for the first time is a daunting prospect. When I bought Lady Jane, a guy called Stuart, who I met the day before, lent me his rib (one almost exactly the same as our new one). I did not know how to steer it properly, or anything else for that matter, still he let me take it. An act of blind faith in the sturdy construction of the rib rather than anything else I think. When he saw me try to dock it he did give me a ‘parking lesson’ for the next time I took it out though. Baby Jane, with a tiller, had everyone guessing what I was up to for a while, even I was not sure about the outcome of a few maneuvers! Although I've seen her do it well, Kate declined docking Baby Jane, saying the tiller was ‘all back to front and confusing’- a sentiment I heartily agree with. Here you can see me, or rather my bum, in Baby Jane on the momentous occasion of letting the last of Lady Jane’s lines loose for our voyage round to Fareham. Both Kate and I are working our way through RYA training, giving us qualifications as well as practical experience. This has been a relatively low priority so far, we have completed powerboat 2, as there is plenty else to do. 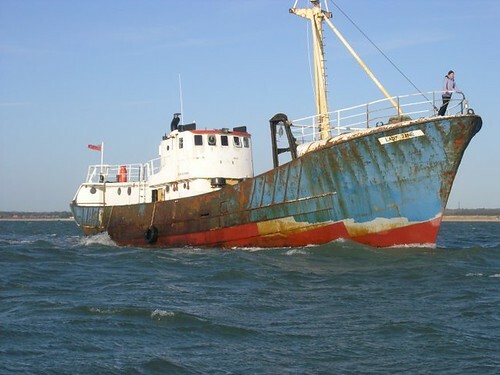 I know of someone who will apparently run the rest of our courses in Lady Jane, which will be very interesting, especially docking her or taking up a mooring. The results of those training days will make a good read, I've no doubt. All I can say is that I'm glad that all the boats we have driven so far have had nice squishy edges! I now have a deck strewn with rubble, lifted from the fish hold. It is estimated that I have about 3 tonnes worth of the stuff right there. The next deck project will be to get rid of it. 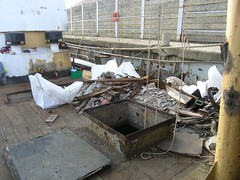 The rubble is the remnants of the insulation and concrete lining of the fish hold. The wood, fastened to steel 'ribs' within the hold, appears to be what was used to hold the whole lot in place. My sympathy goes to the previous owners who started the clearing out of the fish hold, as I now appreciate just how hard they worked on getting as far as they did with this particular task. 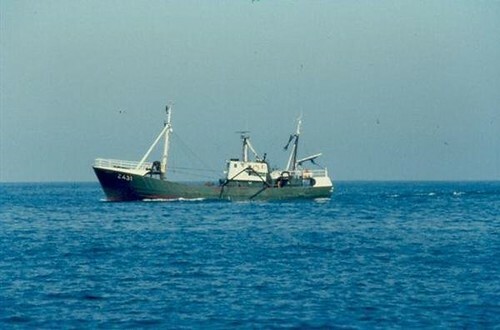 When I first bought the boat I had a few tonnes of rubble left on deck, and have seen photographs of piles of wood they had taken from the hold. It constantly amazes me how one project leads to another, and so on. In this case, I need to lift to the rubble onto the wharf, and from there into a skip. To do this I need to rig the lifting boom properly, something I've needed to do for some time now. Yup Karen, you knew it was going to happen, I finally got around to blogging about rigging! On the subject of comparisons, I received both of these pictures from Urbaine Creel, showing Lady Jane at different stages of her career. 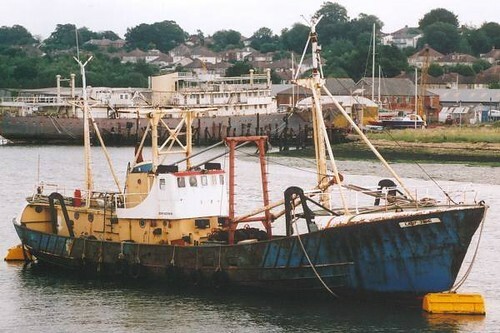 I turned up this picture of Lady Jane moored in the River Itchen, as she was before any gear was cut off of her. It is interersting to compare her against a much more recent picture. 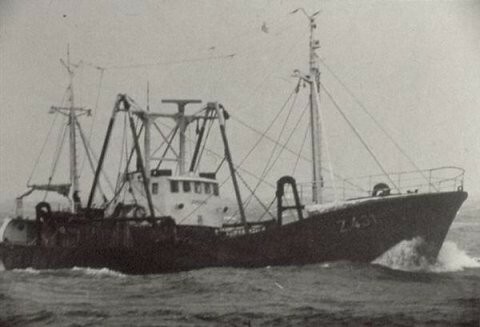 This was taken on her voyage round to Fareham. While Kate and Dawn slaved away cleaning the galley and crew quarters, Dave, who is Dawn's husband, and I got stuck into clearing debris out of what was the fish hold. Here you see Dave prising some of the remaining wooden planks from the inside of the hold. This huge space will probably be converted into cabins, each with an en-suite shower and toilet. Dave had always said he did not mind hard work, and was keen to help - little did he know how hard it would be! Still, he said they both enjoyed themselves and would happily come back and do some more. I'm always surprised, and touched, that people like Dave and Dawn are so willing to get stuck in and help. While there is still more to do, the back of the job is broken. I could never have done what we did by myself. And no, the hold does not stink of fish any more. One of the things I have really come to enjoy is the variety of things going on around Lady Jane. On a nice day I might try setting my camera up on the wall by the wharf and taking a series of pictures over 24hrs, showing the ebb and flow of the tide and the goings on throughout the day. As I mentioned, the creek is tidal and, with the tide out it would probably be possible to walk to the other side. Not too pleasant a stroll though, as it's very muddy. Molly, the dog, would probably enjoy it! The combination of the winter and the tidal effect means there are not many boats about, asides for the boats moored up at the nearby marinas, some of which have people living on board. To some extent I miss the bustle of the traffic up and down the River Itchen as there was always plenty going on, even in winter. Presumably though things will get busier in the summer. You can just see Robin in his crane, off loading gravel which has been dredged up from the seabed somewhere in the channel. 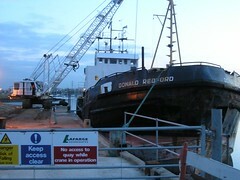 The Donald Redford, a dredger, is a regular visitor to the quay where Lady Jane is berthed, and well known in the Portsmouth/Southampton area.The gravel is subsequently sorted into various grades of sand and stones, and sold to customers who turn up to be loaded with sand in all manner of vehicles, from tiny trailers and small trucks through to large lorrys. I didn't mean to but...I bought another radio. Yup, I really did. I went into Fareham with no intention of getting anything other than a pastie, and maybe a sausage roll or two, when there, in the window of an electrical goods shop were a line of those new fangled digital radios, calling out to me for attention. I know I have an engagement ring to buy, and a whole load of tools and boat bits, but I'm justifying the radio by thinking sometimes it's too quiet working alone on board, and I will have free wind power to run the thing. 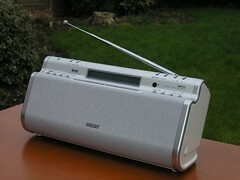 It can also play music from an mp3 player for when we are far out to sea, beyond normal radio reception range. It's a Sony XDR-S1, complete with remote control, and does sound good. I kept the receipt this time, just in case. Progress on the wind generator project was very limited, as the weather on the weekend was pretty wild with wind, sleet, hail, and snow, interspersed with brief periods of sunshine. Big strides were made on the installation of the alternator though. After cutting and welding channel section we could crank the alternator into the engine room and, after a last minute hitch with an unexpected protrusion interfering with the fitting, we could lever the alternator into it's final position. All that needs doing now is to fit the correct size pulley and drive belts and the donkey engine will be able to produce ample mains electricity for the boat's needs. The picture shows the black alternator nestled in it's new home, and my venerable, old 24 horsepower Lister donkey engine to the left of it. I know - it needs some work. The green pipe and grey box is the spare bilge pump, which works off of the donkey engine. 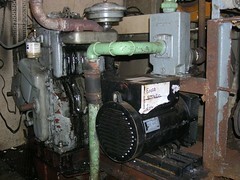 The whole lot is installed on the port side of the engine room. With the ability to produce electricity using the donkey engine I will need to install a mains fuse box and install wiring through to plug sockets conveniently located where I will need them throughout the boat. It's my intention to install a switch so I can select my mains source from any one of the alternator, my small generator, the inverter (the device to convert battery power to mains power) or shore power, giving me flexibility to choose the best power source depending on the circumstances. There is no doubt that getting the new wind generator mounted on top of Lady Jane's mast is going to be a challenging exercise. It is heavy and unwieldy for just one person to handle, plus the mast is very high. That is me you can see up there, cutting off the two poles angled at 45 degrees, in preparation for welding a vertical pole which will support the generator. Good thing neither Robin, who will do the welding, or I are scared of heights. Next will be to haul the cable, which will connect the battery bank and generator, to the top of the mast, mount and connect the regulator, ammeter, volt meter and fuse by the battery bank, then finally haul the generator up to the top, connect it up and secure it topsides. Sounds straightforward, right? Installed at over 10 meters (30 feet) above the deck, the generator will be in the best place to catch any wind that's going, even somewhere as sheltered as Fareham. Some days, things seem to take so such effort just to achieve even a tiny bit. Lady Jane was originally named Judith - after St Jude, the patron saint of lost or impossible causes, a statue of whom I have on board. Appropriate really! 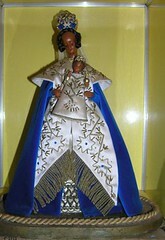 Incidentally, I'm told Lady Jane would not be welcome in Belgium if the St Jude statue is not still on board. I knew things were not going to go so well virtually immediately I got on board Lady Jane. I regularly check the charge of the battery bank using a multi meter, a testing meter which shows how much voltage the battery has, it showed no charge. Not good! I suspected the meter was faulty as the power has been turned off, and there is nothing I know of to cause any discharge. To test the meter, I opened up a torch to get the batteries out and broke that! At that point I should have just packed up and gone home. In the event it was the multi meter that was defective. The objective for the day was to setup everything necessary for installing the wind turbine on the top of Lady Jane's mast. We did not even get close. The majority of the day was spent tracking down a piece of scaffolding pipe which the wind generator will slot into once the pipe has been welded to the top of the mast. To be fair though, I now have all the extra bits and pieces I need, such as an ammeter and volt meter, from a company called Furneaux Riddall & Co Ltd. Their exceptional service deserves a special mention here, especially after the poor experience I had with one particular electrical distributor while trying to get the same stuff the previous day. Thanks for all the help Robin, hopefully next time round we'll get a result. I found this Smartwater stuff today, courtesy of a post titled "Coppers taunt London burglars with cruel Valentines" on the excellent Boing Boing directory of wonderful things. I think I'll look into this a little more for Lady Jane. I like it so much when things work out easier than I expect. The assembly of the generator proved to be pretty straightforward. The picture shows me holding the completed product, to give you some idea of it's size. The reason for the funny look on my face is that at 15kg (33lbs), and an unwieldy shape, it's not really possible to hold a pose for the camera for too long without pulling faces. The inset shows all the bits for the generator I received yesterday, though a lot of the pieces are for the fuses and for the regulator which is the black box you can see. The regulator 'dumps' any excess power generated once the batteries are charged to the green resistors, visible next to the regulator, to prevent damaging the batteries by overcharging them. Now I have a good idea of how it will all physically go together, I'll need to go and buy some bits of wire, an ammeter, a voltmeter, a wire crimping tool and crimps, a soldering iron and some solder so I can put it all together on Lady Jane, oh and I need a pole for the generator itself to sit on. I already have some good wire on board for the cable run from the generator to the battery and some plywood to mount it all neatly. Mounting the generator at the top of Lady Jane's mast will need careful planning, to ensure everything possible is done to prevent damaging anything or, more importantly, hurting anyone. I suspect this will be the most complex step and certainly the most daunting. I'm really looking forward to the luxury of having a fridge and freezer running continuously on Lady Jane. 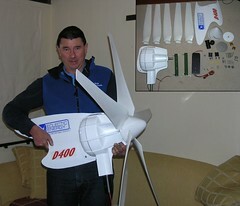 The wind generator from the nice folks at Eclectic Energy has arrived today.... in pieces. I wonder how Kate will take to packaging and generator parts spread around the living room floor while I wrestle with assembling it? I suspect I'll be banished to the shed this evening. Oh the fun of it! Kate and I took the rib out for the first time today. There should be a law against having so much fun!!! The weather, although a bit cold, has been pretty good recently, so I have been working on cleaning up the last of the footings on deck. This project has had a high priority, simply because water has been collecting in these spaces, causing corrosion through the underlying deck and then holes into the hold below. The picture shows the last of the footings to be cut out, before any work has been started. You cannot see it, but the first job was to weld a new plate into the foooting itself, because the underlying plating had rusted away almost completely. 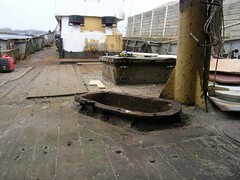 The footing is now cut and ground back to deck level, awaiting rust proofing and priming. You can see the remnants of the large footing I've been working on in the background, partially filled with water. This, along with the one in the picture and it's twin, will soon be painted then concreted in, ending this particular problem for once and for all. The next deck project will be the start of rubbing down and painting of the boat. 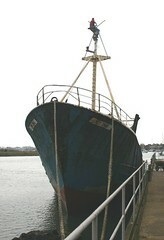 I'm thinking of doing a 'top down' approach, starting with the top of the wheelhouse and working down to deck level. Then starting with the top of the mast and working down the forepeak to deck. I'll then start on the outside of the hull and then, finally, do the inside of the hull, including the fish hold. I'm thinking that if I use a 'good enough' approach, the job will go faster and the returns in terms of time to completion and the overall look will be far better than trying to aim for perfection at every step. The objective here being to stop the rust and have Lady Jane looking good sooner, rather than later. I took the rib, as yet un-christened, into 'The Outboard Centre', as the mechanic who looked at the engine for me before I bought it had said the engine had some 'issues' and needed looking at. "Hmm", the mechanic from 'The Outboard Centre' said when he first looked at my engine, "It is old". In the event, after a change of spark plugs and a clean out through the carburetors with some mysterious 'gunk' from a spray can, the engine ran like a treat, an old treat admittedly. I was incredibly relieved. I also bought a fuel can and the necessary pipework to connect it to the engine, as the fuel tanks on board the rib need work, so as to be able to get the rib in the water soonest. Now, the only thing I have to do before putting the rib into the water is to sort out the left hand self drain. As you can see from the picture there are two flexible tubes, 'elephant trunks', the right hand one is down and the left up, showing where it has rotted through. When the rib is travelling through the water the rib lifts up high in the water on it's chines, the 'fluting' you see down the length of a rib's hull, with the deck sloping down towards the back. In this position any water, such as splashes from waves, which gets into the rib simply drains straight back out through the self drains which are left trailing down behind the boat. 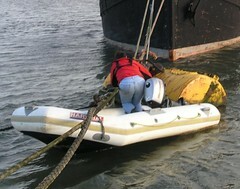 When slowing, or stopped, the trunks are hauled up, preventing water from getting into the boat. 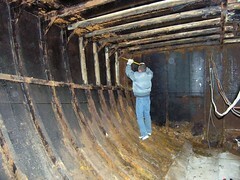 With a drain rotted through, the rib would fill with water. Not really a problem, as the rib will not sink, but I hate getting my feet wet! Fixing the self drain is not the end of the rib related work to be done, as you can no doubt judge by the pictures, but at least Kate and I get to go for a spin in it and have us some fun. It's a boat day tomorrow, so my next blog entry will likely be on Thursday 3rd Feb. I'm taking the rib down to Fareham to have the engine looked at. As it happens, the place is right next door to the yard where Lady Jane is at. Hopefully this will not be too expensive a trip....Yeah right, this is boats! In her original configuration, Lady Jane was built with accommodation for the skipper and six crew, that remains pretty much unchanged today. The skipper's bunk is in the wheelhouse. I presume that by day a single bunk converted to a chart table somehow, but much of the original wood has been cut away to make space for a double bunk, so it's impossible to tell really. 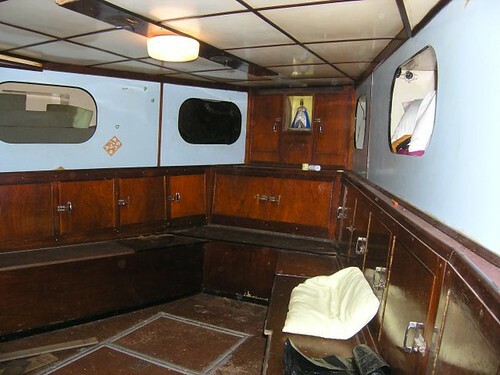 Below the galley is the crew quarters, the space where the crew lived and slept. The crew slept in 'coffin bunks' arranged three to a side, you can see two of them on each side in the picture, over the cupboards and benches down the sides. Presumably they are called coffin bunks on account of the narrow slot you have to scramble through to get into the bunk. Each bunk has a personal storage space and it's own light with a switch. It's hard to tell from the picture, but the accommodation space is pretty generous. I'm just over six foot and there is plenty of space for me in those bunks. Sleeping in the bunks is surprisingly comfortable, especially with a big quilt stuffed in there, but not for the claustrophobic. The reading light and storage space really come in handy for finding and storing the stuff you always seem to need to hand overnight. In the summer Kate and I slept in a bunk up in the wheelhouse, mainly because it was bright and we could see all the action up and down the river if we cared to. Now it is winter it is time to head below decks where it is cozier. There is very little going on around where Lady Jane is berthed, so we won't miss much either. At the moment though, the crew quarters smells musty and all but one of the bunks has been damaged in some way, so there is a lot of work to do down there. At present, my efforts are focused on cleaning up and restoring the original bunks as best as possible. I'll also build a reasonable sized bunk for Kate and I to use while we sleep down below. I'm seriously debating gutting the place and starting from scratch with modern insulation and a design which will use the available space more effectively, much of it is wasted at present, possibly even incorporating an additional cabin. What is interesting is that the access to the crew quarters is smaller than the size of the fittings inside, making any re-fit a challenge. I'm keen to avoid another epic like the fridge incident.